Preparing for potable water dive in effluent chamber. 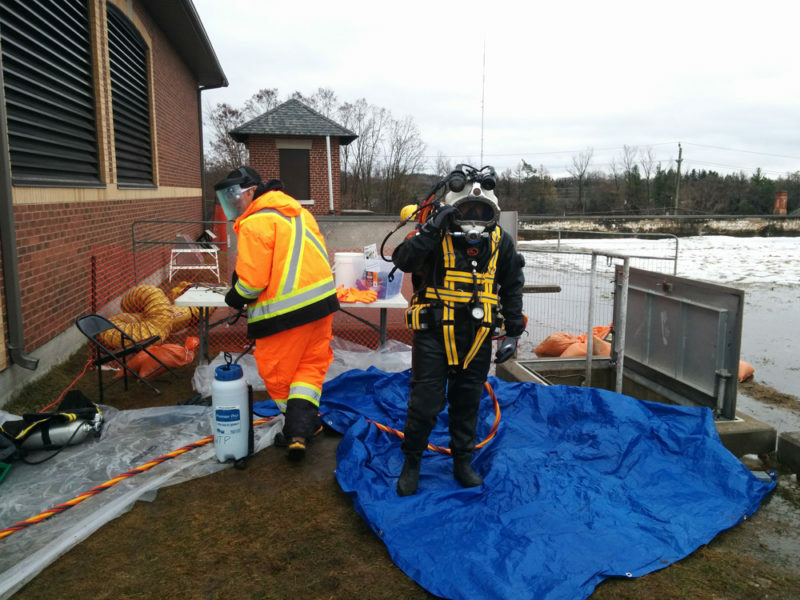 The Peterborough Utilities Commission (PUC) in Ontario treats raw water from the Otonabee River for distribution to over 80,000 customers. It wholly owns and manages its infrastructure and utilizes multiple water storage tanks and on-site reservoirs at the water treatment plant. Total water storage capacity is 45,000 m³. At the plant, average operation flow is 55 million litres per day (MLD), with a rated capacity of 104 MLD. One particular reservoir at the plant is a 50 m x 50 m x 5 m deep buried concrete tank that was constructed in the 1920s. 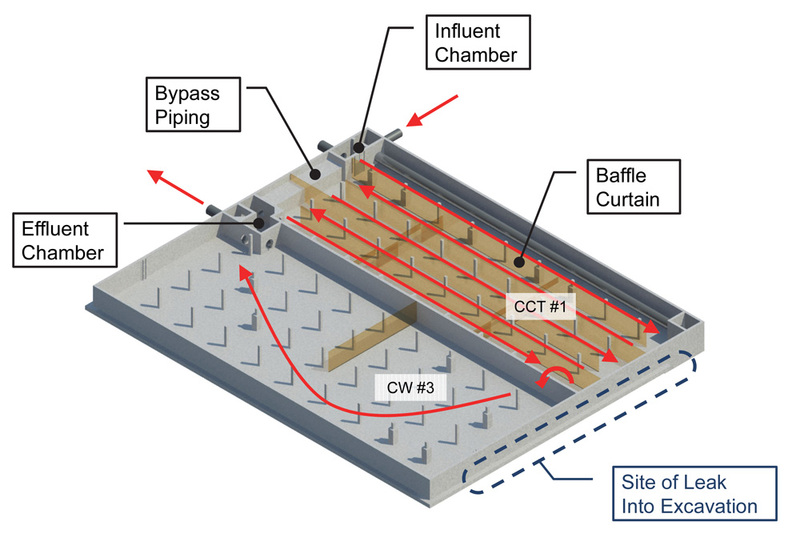 It consists of a chlorine contact tank (CCT#1) and a clear-well (CW#3), separated by a central dividing wall. The reservoir also contains internal chambers for influent and effluent flow. There is also cast-in-place bypass piping that was constructed in the mid 1990s for emergency situations. This reservoir accounts for roughly 10% of PUC’s total water storage capacity. Diagram of the water reservoir built in the 1920s. In 2013, PUC retained R.V. Anderson Associates Limited (RVA) to provide consulting engineering services and to produce contract documents for a new 36 m x 36 m x 5 m deep reservoir at the water treatment plant. This reservoir would consist of a CCT#2, a CW#4, and associated connection chambers. It was to be situated south of the existing reservoir, and positioned to minimize disturbance of existing structures. In early October 2014, while the base slab of the new reservoir was under construction, the 1920s reservoir had a leak event that partially flooded the new construction site. Water was flowing through the southern berm that backfilled the existing reservoir at an elevation corresponding to the underside of the floor slab.